I saw this on Broadway and I was actually a little underwhelmed by it. There's a bit of tinkering with the facts and it simply wasn't as rich as "The Queen." But Michael Sheen was great. And I think the interview sessions were the most fascinating. And I am looking forward to the movie. I think his Frost was more of a revelation because I knew less about him. Just watching his body language as he's sitting in his chair listening to Nixon was terrific. I agree with the cat and mouse aspect. I've heard it described as a boxing match, too. Each one needs the other to try and rehabilitate his career. 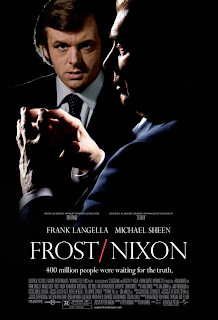 Frost needs to get Nixon to say something about Watergate and Nixon wants to avoid saying anything. I think you'll enjoy the film version. It opens up the story in a way the stage version would be unable to. Plus, the crux of this "boxing match" is the TV close-up. Easy to show via film, impossible to depict on stage.